As per usual, I did some damage at Somerset Collection this past weekend (the mall that most people in the Oakland County area flock towards to do serious shopping). My mom and I went to Macy's to find some work clothes for her, and in the process I snagged a pair of Michael Kors cork and black sandals, as well as my first pair of brown heels ever (by Marc Fisher). After my mom left, I decided to continue wandering around Somerset, and as always, I found myself in Sephora. I've found that it is next to impossible for me to walk into that store without purchasing anything, even though I own around 30% of the store's inventory already. I've tried a product from almost every brand they carry. I have my favorites, but I can safely say that I like at least one item from every product line. 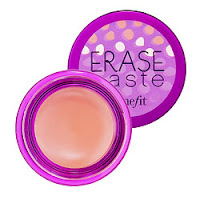 Benefit Erase Paste is a concentrated, creamy, blendable concealer that instantly brightens and camouflages all-in-one. It has an innovative formula which makes sure signs of stress and fatigue are a thing of the past. These three brightening neutral shades give every gal correction perfection. I ended up buying it for my occasional dark circle. I wear (2) Medium, but it also comes in (1) Fair and (3) Deep as well. When I put it on this morning, the product nearly paid for itself when it literally erased my dark circles. My only reservation was that it does feel a little bit heavy on my skin, but if you dab on the tiniest bit with your ring finger, you'll have more than enough to cover whatever you need. I don't recommend using it all over your face, solely because of the weight of it (I tend to prefer a more natural look). But for the blemishes and dark circles, it works like magic.